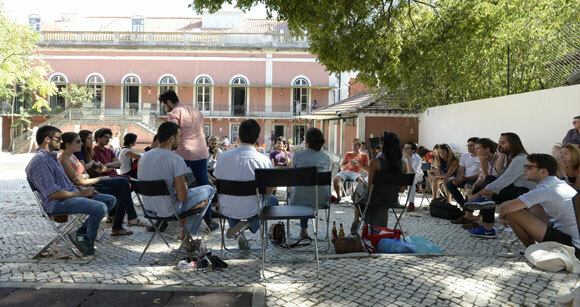 By initiative of Gonzalo Herrero Delicado and in association with Blueprint magazine, the Post World’s End Architecture series became an event during the opening week of Close, Closer, the 3rd Lisbon Architecture Triennale. Unfortunaly, Gonzalo couldn’t make it– and therefore Blueprint magazine’s Shumi Bose and I led the event in the courtyard of the Triennale HQ, during a wonderful sunny afternoon. The informal but energetic discussion was a fantastic opportunity to hear from Portuguese and Spanish practitioners — including dpr barcelona, O Espelho, Ateliermob, Polígono, blaanc, Artéria, Inês Moreira, Paulo Moreira and many others. Their passionate and unromantic debate described both the practical and moral predicaments of working in architecture today, and of maintaining civic and social principles under financial constraints. Thank you to all the participants for such fantastic contributions to the discussion, and thanks to the Lisbon Architecture Triennale for having us!